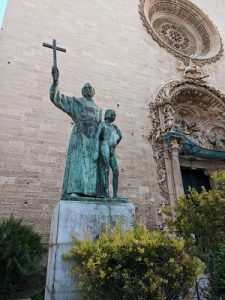 Palma de Mallorca, Spain is a beautiful seaside town and rich in history. Father Junipero Serra grew up here and left on his journey to start the missions in California and is remembered with his statue. Being from San Diego, I’m familiar with his legacy. 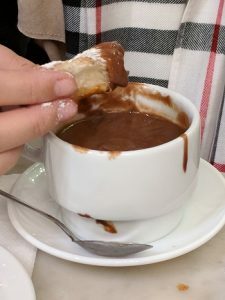 One thing I remembered about Spain from a previous trip, was to drink their rich, silky and thick hot Xocolata Calenta, pronounced choc-o-la-ta. 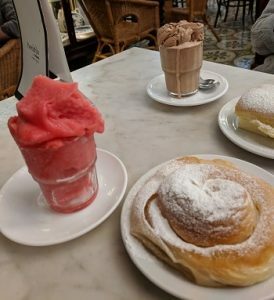 And in Palma de Mallorca the drink is traditionally served with Ensaimada, a warm pastry. The proper way to partake is to dip pieces of the pastry into the cocoa. Messy and good. 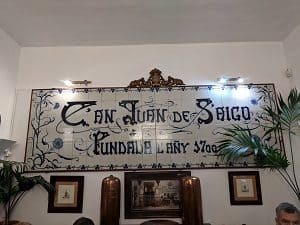 Our tour guide at Ca’n Joan de S’aigo cafe pointed out the large copper canisters and said as a child,she remembered ice cream being made in them. And with more ice than cream in the frozen dessert. 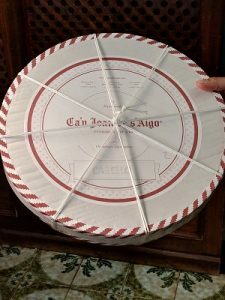 I was so impressed with the round take out box filled with pastries and tied with a string, I included a picture.